A sensitive and positive look at some of the big issues that concern children as they grow up. 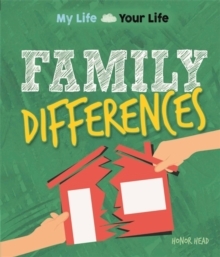 This book looks at different family set-ups, including single parents and step-families. It examines issues that can arise within families - sibling fall-outs, poverty, abuse, illness and child carers, and getting on with parents. It is part of the series MY LIFE, YOUR LIFE, which takes a sensitive and positive look at some of the issues that concern children aged 10+. It explores issues including sexuality, gender, self-esteem, prejudice and discrimination and promotes and encourages discussion. It examines difficult themes from all angles and promotes discussion and debate. By thinking creatively and critically, children can learn to accept their differences, embrace diversity and improve their sense of self and how they fit into the bigger picture. Each title also provides advice in the form of practical ways to cope with distressing or difficult situations.